Combining the benefits of IR systems (gas or electric) with air flotation results in a drying system which has superior heat and mass transfer performance. 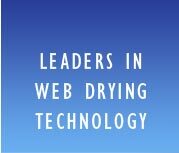 Global Technology LLC has teamed up suppliers of gas and electric IR to provide the next generation of energy efficient drying systems. How? 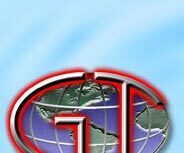 By Integrating proven IR drying (either gas or electric) technology with Global Technologies air flotation and expertise. The IR section is completely integrated within the dryer enclosure making the system very energy efficient. Using the exhaust from the IR system as a source of energy for the air dryer adds to the efficiency of the system. 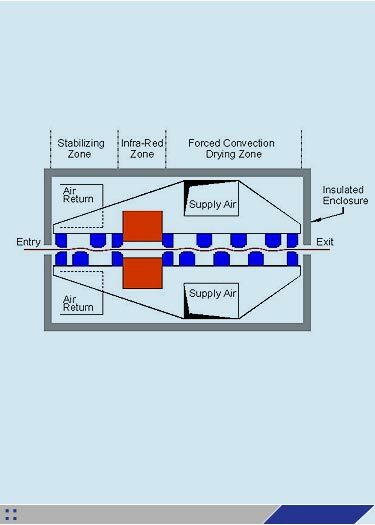 Incorporating proven Global Technologies air bar technology insures a stable web throughout both the IR and air dryer sections and isolates the IR section (important for gas systems) form the extraneous air flows. The system operates as two zone dryer with the IR section functioning as zone one and the air system as zone two. Integrating the operating controls for the combination dryer provides operators with a friendly and easy to operate system. Superior web stability through the system providing positive web flotation.